What Effect is a £2,000 Scrappage Scheme Likely to Have? This assumes the scheme will offer people who have owned a car more than nine years old for more than a year a £2,000 scrappage voucher to put against the cost of a car less than 12 months old emitting CO2 of less than 150g/km. 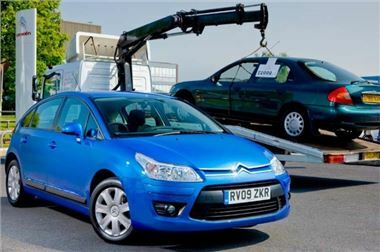 The first thing it will do is release cash purchasers who were hanging on to their old cars in the anticipation of a scrappage scheme that would suddenly make a £300 car worth £2,000. These people will reason, why leave money in a bank earning diddly squat when they could put it into a new or nearly new car? I would guess that most of these people will be retired. I dare not hazard a guess of how many of them there may be. The second thing it might do is encourage working people to get rid of their old cars and put a mix of savings and finance towards newer ones. But unless the finance is protected by redundancy insurance (as it is with deals offered by Renault, Nissan, Honda and Volvo), I would not bank on a massive take-up. There is a significant factor that made a scrappage scheme in Germany hugely “successful” that might not apply in the UK. In Germany, the 2,500 government scrappage money was largely matched by 2,500 from the manufacturers. This brought the price of a 10,000 car, such as a Citroen C1, down to 5,000 and made it very tempting. That can’t happen in the UK because with Sterling currently sitting at around 40% less against the Euro than it was two years ago, by not increasing prices by 40% manufacturers are already subsidising the UK market. They cannot afford to subsidise it any more. There is very little manufacturer profit on a small car anyway. I anticipate several more rounds of price increases in the UK this year. And great pressure from the manufacturers to reduce fleet discounts. The knock-on effect of this could be significant increases for people running cars on Motability Finance (Europe’s largest fleet). With Sterling 40% down against the Euro and Motability demanding 40% discounts, EU manufacturers have been selling them cars at a substantial loss and obviously cannot continue to do so. On top of which I don’t entirely agree that scrapping a perfectly good 1999S Mondeo (Warranty Direct’s most reliable 10 year old car) will benefit the environment, or society in general. Scrapyards may not be able to cope, and small garages that kept cars like this on the road will go bust, as they have done in Germany. So I can see the scrappage scheme temporarily boosting the new and nearly new car market like any good marketing incentive. But I don’t actually see it leading to UK motorists in general being any better off. And that £2,000 a car will be another burden the taxpayer has to bear on top of the already crippling debt the government has laid on each and every one of us.